Premier League stats: Will this be the highest scoring season? This could be the Premier League's most goal-crazy season, bookings for simulation are taking a dive, Armenia get themselves on the scoresheet and who has waited the longest amount of time between top-flight goals? After 29 goals were registered across Saturday's six games, stats fans were purring in anticipation at the prospect of a record-breaking weekend of goal action. Alas, three 1-0 wins on Sunday let the side down, before Liverpool's 2-2 draw with West Ham left a final sting in the tail. That meant there were 36 goals in total over the weekend - seven short of the Premier League record of 43 set between 5 and 6 February 2011 (since the league was reduced from 22 to 20 teams in 1995). 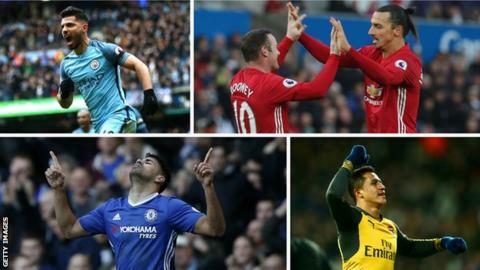 But there is still hope for the goal fanatics out there - this season is on course to be the highest scoring in the era of a 20-team Premier League. There have been 434 goals from 150 games this term and if the scoring continues at its current rate, it will reach 1,098 by the time the 380th and final game is played in May. The record to beat is 1,066 from 2011-12. And when you take the average number of goals per game, this season's average of 2.89 - if maintained - would be the highest in Premier League history. Oldham Athletic stayed up and Crystal Palace went down, while Ian Rush, John Barnes, Teddy Sheringham and Peter Ndlovu were all on the scoresheet. Ace of Base were in the top 10. When are we talking about? The final day of the 1992-93 season - 8 May 1993. That is how far back you have to go to find the last time six home teams scored three goals on the same day in the Premier League. It happened again on Saturday when Watford, Arsenal, Burnley, Hull, Swansea and Leicester all put three goals past their visitors. For those of you old enough to remember 1993, here's a trip down memory lane. For those of you not old enough to remember 1993 - yes, Oldham, Coventry and Sheffield United used to be Premier League teams. Ask most football fans what the scourge of modern football is, and they will probably answer with one of three things: players wearing gloves, feigning injuries and diving. And this weekend diving flopped itself back on to the agenda when Robert Snodgrass looked suspiciously untouched when he won a penalty for Hull City against Crystal Palace on Saturday. The player apologised, saying he was "riding the tackle". Palace boss Alan Pardew said he should be "embarrassed". BBC Match of the Day pundit Danny Murphy called for retrospective punishment. But have yellow cards for simulation - to use Fifa's jargon - been on the rise in the Premier League? Interestingly, the answer is no. The highest number of yellow cards dished out for diving was 33 in 2012-13 - 2.64% of the total for the campaign. The second highest was 27 (2.13%) in 2008-09. This season, there have been eight bookings for diving - 1.28% of the total of 623 yellow cards. That ratio would be the second lowest since 2007-08 if it continues. Who are the one-man teams? Regardless of how you felt about Robert Snodgrass' means of winning a penalty, there is no doubting his importance to Hull City. The Scotland international scored the penalty and also provided an assist in the 3-3 draw with Crystal Palace, meaning he has been involved in 50% of his side's goals this season (scoring five, assisting two of Hull's 14 goals). But that fades in comparison to Jermain Defoe's influence at Sunderland. The striker, who won the last of his 55 England caps in 2013, has been involved in a monstrous 71.4% of the goals his side have scored in the Premier League this season (scoring eight, assisting two of Sunderland's 14 goals). "But who has been the most influential player for a team in any particular season?" we hear you cry. That would be Matt Le Tissier for Southampton in 1993-94. Just the 25 goals and nine assists from his team's 49 goals that season - a 69.4% involvement rate. Could Defoe be on course to top it? Hands up those of you who remembered Stefano Okaka scoring for Fulham against West Ham on 2 May 2010. Give yourself a pat on the back if you did. The Italian was on loan from Roma at the time and journeyed on to Bari, Parma, Spezia, Sampdoria and Anderlecht before, 2,414 days later, scoring in the Premier League again, this time in Watford's 3-2 win over Everton on Saturday. Brilliantly though, 2,414 days is nowhere near being the longest period of time a player has waited between scoring a Premier League goal. That title belongs to no-nonsense defender Matt Jackson, who went a whole 4,935 days (more than 13 years) between Premier League goals - stretching from 8 May 1993 for Everton in a win against Manchester City, all the way to 11 November 2006 when he netted for Wigan in a victory over Charlton. Henrikh Mkhitaryan's first Premier League goal for Manchester United secured a 1-0 win over Tottenham on Sunday - but it also sealed a small victory for Armenia. The former Soviet republic, with a population of three million, became the 96th different nation to have a Premier League goalscorer. But here is the big question: can we reach 100 this season? Well, technically, yes. It is tenuous, but these are the four players who would have to score this season to bring up the century. Celina is on loan at FC Twente, so he would need a recall. Have we missed a current Premier League player whose country has never had a goalscorer in the competition? Tell us using #bbcfootball on Twitter.